Trafigura handles the supply of metal concentrates from mines to smelting facilities and of refined metals from smelters to downstream consumers such as rod mills and galvanisers. Trafigura trades copper, lead and zinc concentrates as well as alumina, the prime source of aluminium. 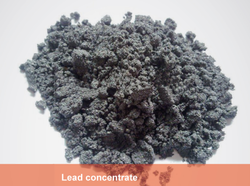 Lead concentrate is an intermediate product used as raw material in the production of Pure Lead. Lead Alloys and Lead products. The quality of different lead concentrates can vary but sulphide concentrates typically contain lead and sulphur.